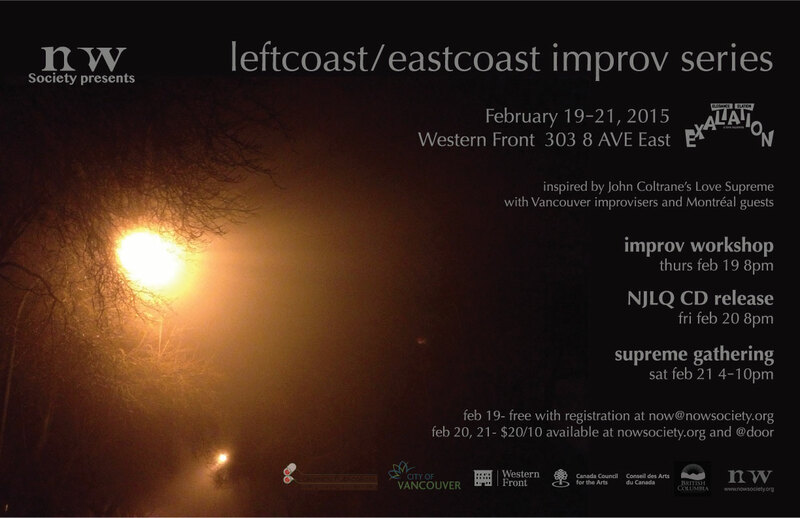 The NOW Society Ensemble is drawn from Vancouver's finest improvising musicians. Currently under the Artistic Direction of Lisa Cay Miller, the NOW Society Ensemble has been presenting engaging and varied concerts since 2008 in a multitude of venues and formats, from formal concert halls to DIY stages, from showcases to concerts and installations. The music is closely associated with Musique Actuelle and Creative Music, fusing improvisation and composition, the predetermined with the undefined. Events planned and unplanned are linked, craft and skill navigates the endless possibilities of the unknown. With flexible instrumentation and five to ten members, the NOW Society Ensemble proudly presents compositions commissioned by the NOW Society, and has premiered new works by Giorgio Magnanesi, Rainer Wiens, Joane Hétu and Gary Wildeman. The ensemble collaborates with world-renowned composers, performers and improvisers; recent and coming guest artists include Ellwood Epps, Vicky Mettler, Lori Freedman, Joane Hétu. Jean Derome, Christine Duncan (Montreal), Anne La Berge, Ig Henneman (Amsterdam), Jim Denley (Australia), Pauline Oliveros, Lisle Ellis and Eyvind Kang (USA). The NOW Society Ensemble at the IAMA Montreal 2013 New Music Conference, at the Red Roof Church in Montreal on November 8, 2013. Now Rippled Modality Promo-Mobile from NOW Society on Vimeo. NOW Society Ensemble members include: Lisa Cay Miller, JP Carter, Nikki Carter, James Meger, Skye Brooks, Mike Mike Dowler, Peggy Lee, Jon Paton, Chad MacQuarrie, Brad Muirhead, Kristian Naso, DB Boyko, Tommy Babin, Jesse Zubot, Joshua Zubot, Jon Bentley, Stefan Smulovitz, Joe Poole, Kenton Loewen, and Chris Gestrin. 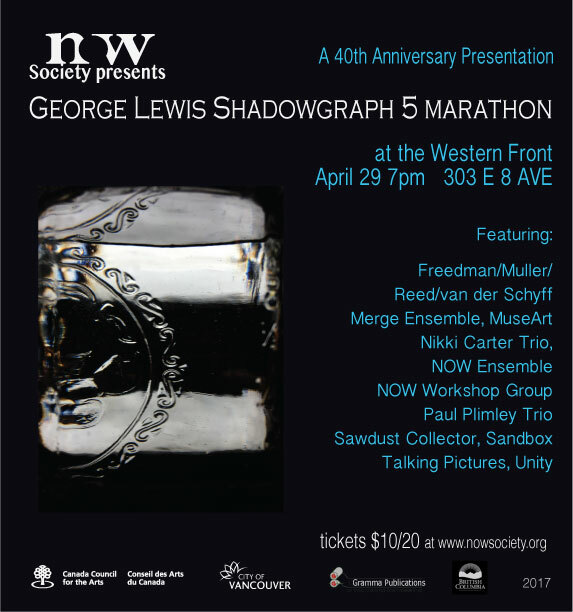 The NOW Society is pleased to begin to celebrate their 40th year by presenting performance of Dr. George E. Lewis’ composition Shadowgraph 5. The piece will be presented in marathon form, a continuous four-hour stream of music performed by eleven ensembles with connections to the NOW Society’s past and present. December 2 and 3, at the Orpheum Annex. 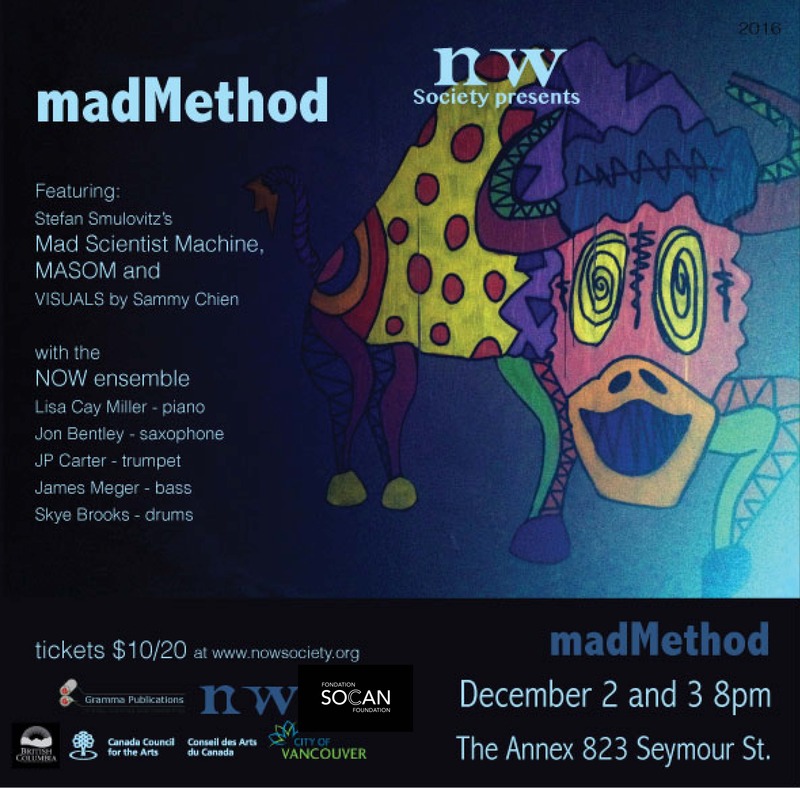 Featuring Stefan Smulovitz’s Mad Scientist Machine, visuals by Sammy Chien and performances by MASOM and the NOW ensemble, madMethod was layers of memory and experience combining light, images and sound, remembered, manipulated and instantly created. 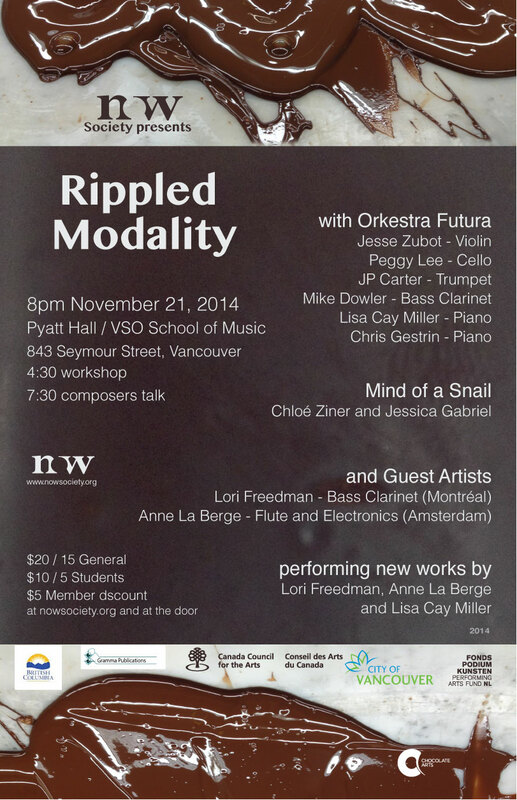 The NOW Society presents the Vancouver Assembly1 Festival, a creative music and improvisational music gathering. 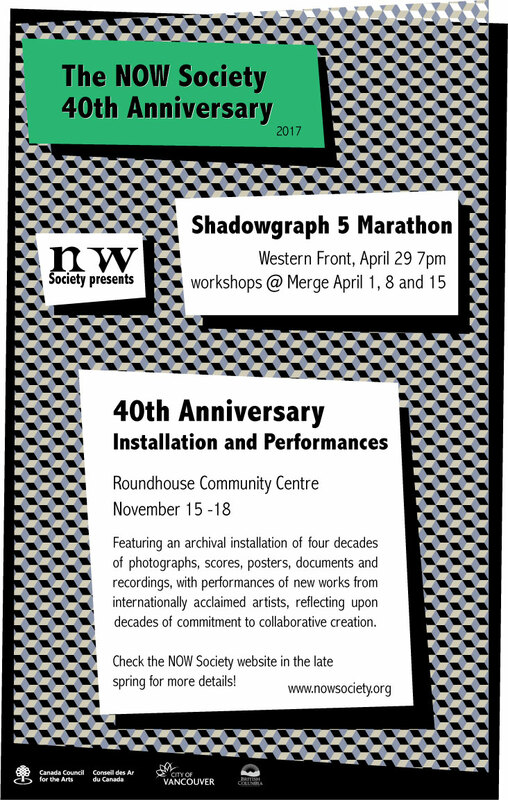 Featuring Nous Perçons les Oreilles - Joanne Hétu and Jean Derome (Montréal), PLANT - Jim Denley (Australia) and Éric Normand (Rimouski, Quebec) the New Orchestra Workshop Ensemble, and presenting the release of the recording and publication of Gary Wildeman’s 48- page comic book graphic score. an improvised concert bridging cultures and continents, inspired by the live painting by Li Tung and compositions by Lisa Cay Miller, Lan Tung and Ron Samworth. 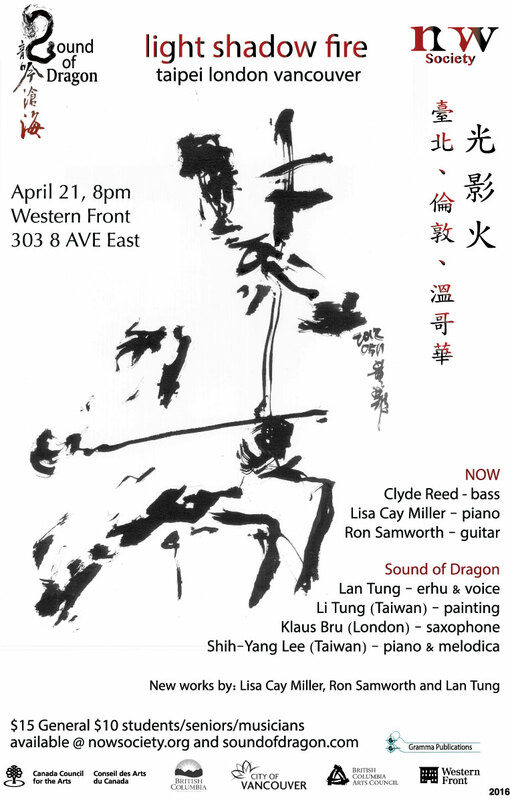 A co-production between the Western Front, the NOW Society and the Sound of Dragon Festival, the concert exempliied the NOW values of international collaboration of communities and interdisciplinary artists. 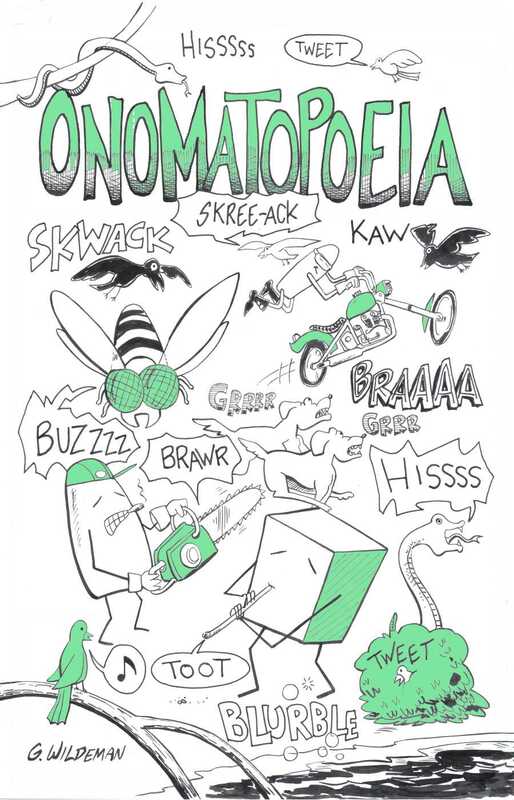 at the Renegade Theatre on December 4 and 5, co-produced with Trunk Puppet from the Old Trout Puppet Workshops. February 19 – 21. The series included the Nouveau Jazz Libre de Québec CD release concert, Feb. 20, a free public improvisation workshop and the members of the NJLQ Trio, Feb. 19 and finally, musicians from NOW ensembles and early improvisers in a six hour Supreme marathonto pay homage to the spirit of the music of John Coltrane on Feb. 21. 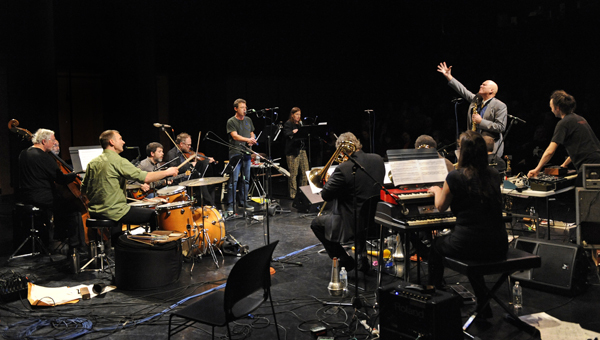 On October 17 at the Vancouver Community College, orkestra futura featured new works by honored guest artist from Amsterdam, Ig Henneman (viola), composer New York City resident and Vancouver born Cat Toren, Mayor Arts award winner Cole Schmidt, as well as a new work by Managing Artistic director Lisa cay Miller. Tony Wilson (guitar), guest artist. on November 21 at Pyatt Hall, workshops on November 19 and 21, featuring guest artists Anne La Berge (flute, electronics, composer) and Lori Freedman (Bass Clarinet, composer). 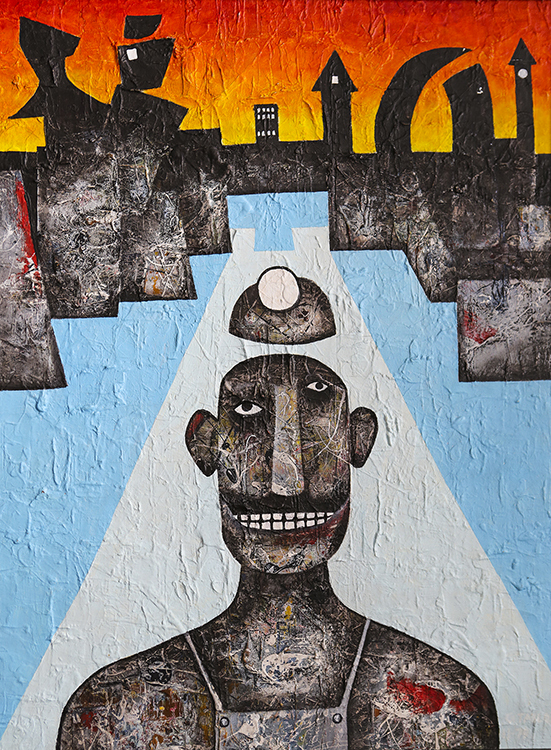 New Works by Freedman, La Berge and Miller. September 14 - Orkestra Futura: Pan-Global Imprint, the Western Front. Guest artists: Mei Han, Bich Hoang, Ali Razmi, Curtis Andrews. October 15 - Orkestra Futura: Meeting of the Minds, Western Front. November 7 - Orkestra Futura: Hear It NOW 2008, Roundhouse Community Centre. Guest Artists Jean Derome and Giorgio Magnanensi.